This week’s challenge has me thinking. Yes I do do that occasionally. There is no way to compare everyday life. Each soul lives uniquely. Nothing is commonplace. Not the experiences that form our days, or the people who experience them. A while ago I went to Tauranga with a friend and as we crossed the street a man’s music caught my ear. I’ve seen him before, huddled with his possessions in doorways. Stories abound about who is is…one story is that he was a music teacher. This day was the first time I saw him play. Perfect satin notes rolled across the street and drew me closer to him. And I wondered what occurrences had changed his everyday life so dramatically. She does not have FIV. We still have no clue what is going on but today for the first time since Monday she actually ate without me force feeding her. Not a lot. A little bit of chicken and some minced heart. But those couple of mouthfuls made my everyday life a lot happier. It is a miserable day here and Jackie is snuggled next to me. Related posts: Jack is unwell. I am hoping and hopeful now that she has taken those first few bites. Life is feeling so much better than it did yesterday. I hope the news continues to be positive? Thank you. She is doing better every day. Thank you for the kind thoughts. Fascinated by the sax player. I wonder what happened to him? So pleased to hear Jackie has started eating. That’s got to be positive. Who knows what happens at times – maybe she ate something? Anyway fingers crossed that all the news is good from here. Hugs to you both. He is a fascinating character. Apparently he can be quite grumpy. But he was okay with me taking photos…I did ask first. He used to have a dog with him all the time. I have wondered what happened a lot since he didn’t have him with him this day. As for Jackie…here is hoping. We may never know what it was. As long as she gets better I don’t really care. Jackie’s eating? Happy dance! Hoping she continues to improve. I wanted to jump and yell ‘yee haa’ when I saw it happening, but I was too afraid I’d scare her off. Thanks for the good wishes. I am so grateful to everyone who has wished her well. So very grateful. I love to hear the saxaphone, don´t you? It is amazing to listen to…especially in the street. Yep I’m hoping my girl is on the mend. Yee haa!!!! Good for Jackie! People living on the streets, with such great talent; such a waste. Thanks Angeline. And yes it seems such a waste. There will no doubt be an interesting story behind the sax player; wonder what happened to his companion dog? Relieved to hear that Jackie has eaten a some food even if it was only a little bit – something is better than nothing, and if she ate it by herself, then it’s progress – let’s hope she continues to go forward. I think there would be Barb. As for Jackie she is doing a bit better each day so I am hopeful. She is doing a little better each day. It is Gilly. You have no idea how those few mouthfuls made my day so much better. I’m so glad that Jackie seems to be doing better, Jo. Hope she continues to improve. Yes, I always wonder about people like your saxophonist. I’m sure they must have sad but fascinating stories to tell. I’m sure he does but he is not a very talkative fellow…he gets a little abusive so I was thrilled he allowed me to take some shots of him. Thanks for the thoughts on Jackie. I am thrilled. Thanks Alistair. For the photo comment and the well wishes for Jack. Thanks again Tom. And yes…you’re right about the paths we take. Makes life interesting. Your photo speaks volumes. And that’s great about Jack! I’m still sending you both positive thoughts. Give her a hug for me. Thanks TBM…for the photo comment and Jack purred when I gave her your hug. Heartbreaking. I hope she recovers from what is ailing her. Thank you !!! She seems to be going forward every day so the news is at present – good. Hope Jackie continues to eat and improve. Thanks Ruth !! Me too. Thanks Sue. I am thrilled she doesn’t have it. She has eaten more today so I am quietly hopeful we are on the mend from whatever it was. And the saxaphone player…his fingers. He is highly sensitive. Who hurt him, Jo? Why did he decide to check out of the ‘normal’ world in favor of a safer place? He isnt so far gone if he let you take a picture. Does he ever sit and talk with anyone? I wish I could talk to him. I am sure he has so many wise things to say. What did you feel about him when you met him? Did you feel strangely at peace or almost anxious? Does he limp or favor any part of his body that you noticed? Have you thought of writing/imagining his story, Jo? It is a yucky day here so we are cuddled up together. The sax player. He is quite aggressive usually and very hard to speak to. I wish you could talk to him too. No limp or favouring I have noticed. He is just usually very withdrawn from the surroundings. That is why seeing him play was fabulous for me. Fabulous shot for the theme. And YAY for Jackie. Take what you can get, a little at a time. Snuggle and smile. We are doing just that Gemma. Thanks for the ‘yay!” And for liking the photo. Just read your previous post and came on here to check Jo.. Glad to know Jack is feeling a wee bit better. Wishing her a speedy recovery. Hugs to you both. Thanks Madhu. We appreciate it a lot. I’m gonna tap-dance for Jackie… good to know she’s faring well. p.s. the pic is absolutely something I had in mind. Amazing! Thanks for the amazing !!! And for the tap dance. I wanted to scream for joy but I was scared I would scare her away. Love the saxophone player. Everyone has a story. sometimes you don’t need to know it to make a connection. Glad you did. Thank you – he is a very interesting character. I have waited a while to get a shot of him that didn’t focus on the homelessness, but on him. Sorry to read about Jackie and sending her healing light… the shot of the musician is terrific. Thanks on both counts. She is doing better. And being VERY spoilt in the process. I wouldn’t take her on in a dark alley !!!!!!!!! a poignant post – and good news about Jackie! may she continue to get better and better!!! Thank you…for both. She is doing much better, much better. A very heartwarming chronicle of someone’s everyday living. We can tell how big your heart is, Jo. I hope your kind nature does something good for your cat’s recovery. Thanks Rommel. Jackie seems to be getting back to her old self. She is eating, though still little bits often. The man playing the saxophone must have a great many stories to tell. I’m sure he is saying them with his soulful songs. There are so many people who are in these positions. He has found his own way of coping. It is the best entry I’ve seen for the challenge. Excellent …!!! Thank you Isadora. I am thrilled you think so of this one. I have had this shot tucked away, never finding the right time to use it but wanting to. So I was thrilled with this challenge because I just felt it really fitted. And yes my beautiful black lady is doing better each day. Last week was very worrying but I am pleased with her progress since the weekend. I think a lot about homeless people, too – mental illness, alcoholism and drugs seem to be the biggest factors, but what factors drive those things in the first place? It’s a fine line for all of us – Gabrielle Bryden (http://gabriellebryden.wordpress.com/) wrote on her blog a while ago about ‘Moondog’, a famous NYC street musician – I had never heard of him – his life was quite fascinating. Glad Jack is on the mend. I looked at her blog…great site…but I couldn’t find the post. Saxophone picture is beautiful. What a wonderful everyday life. The cat picture is too much white I think. Well, in my every day life I always pat them in the head where ever I meet them. Oh yeah, my share this week is about http://albadrln.wordpress.com/2012/09/17/weekly-photo-challenge-everyday-life-batik/. Hope you can have a look at it sometime. Thanks for stopping by. 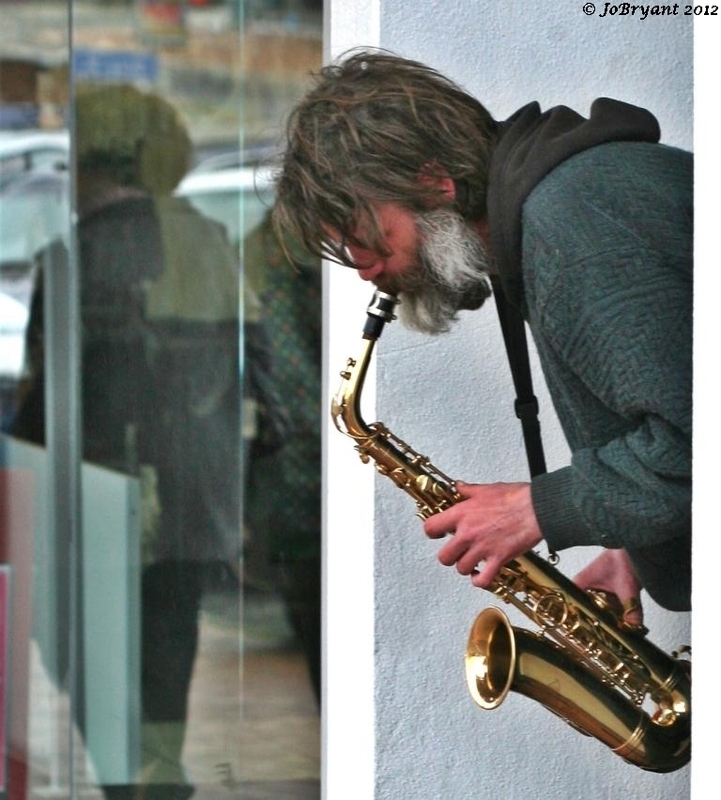 The saxophone player is a homeless man who lives in the town Of Tauranga near here. I am not sure whether he thinks it is a fantastic life…but it was fantastic to hear him play. Sorry you thought there was too much white in Jack’s photo. 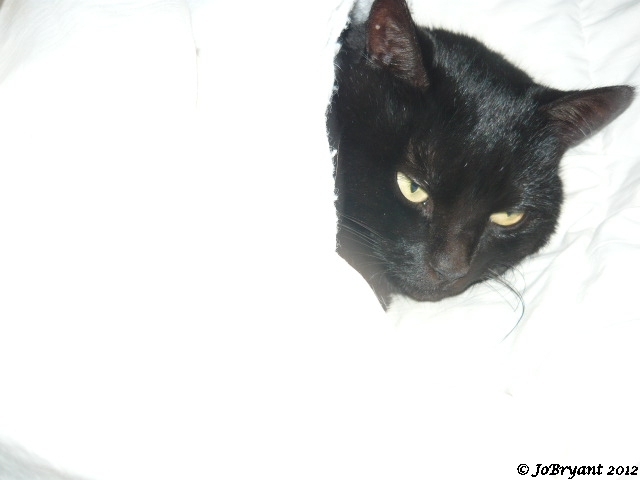 She has been sick and I posted that photo just to let others know what she was doing, which was curling up under the duvet on a cold day with her Mum. Thanks Jo, great post. I love when you show little slices of life around your town. Very glad to hear Dear jack is starting to eat again, that’s a great sign! Thanks Ioanna…I will…she is being very cuddly lately. I too wonder what the turn event was in the saxophone man’s life? that possibly that he doesn’t care to get back up.. Anyway, nice photo Joe! Kisses to Jackie for me please! I have no idea Deborah. One day I hope to talk to him…but he is not very approachable. Jackie says thanks for the kisses…she liked them a lot.